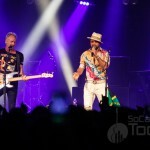 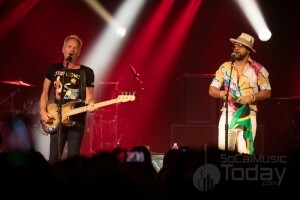 In what could best be described as a musical Mad Lib word game of concert pairings, the unlikely partnership of iconic English singer/songwriter Sting and Jamaican reggae fusion artist Shaggy brought their 44/876 tour to Harrah’s Southern California Casino in Funner, CA on Tuesday, October 16th. 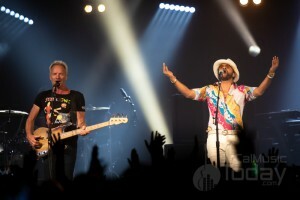 To be clear, these two acts are not just touring together…but sharing the same stage . 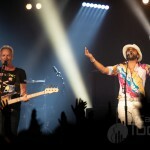 . . at the same time, playing each other’s hits together as well as tracks they recorded together for their 44/876 album released this past April. 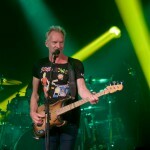 Despite recent health issues that briefly sidelined the tour just last week, Sting’s vocals would prove be to as strong as ever for most of the show. 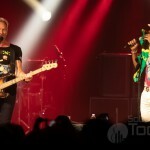 Unfortunately a handful of shows had to be either cancelled or rescheduled, luckily this gig went on as planned with the casino crowd being treated to an intimate show with the ex-Police frontman and his new Jamaican best friend who is best known for his monster hits “Boombastic” and “It Wasn’t Me”. 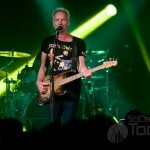 Sting definitely seemed energized throughout the performance; surely putting new spins onto old tunes helped…each song was slightly altered to incorporate Shaggy, giving many a relaxed island vibe and sharing the stage with Shaggy. Portions of the evening played more like a mixtape as there were some serious mashups on the setlist, most notably on song 3 of the set as Shaggy’s “O Carolina” fed nicely into Sting’s, “We’ll Be Together”. 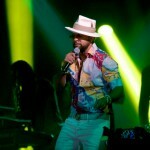 All the high rollers who cruised in from the casino tables and bars were treated to some serious pelvic gyrations from Shaggy on the duo’s offering, “If You Can’t Find Love”. 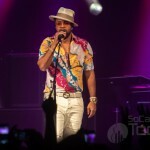 During “Message In A Bottle”, Shaggy created his own crowd vocal competitions—pitting sides of the event center against one another. 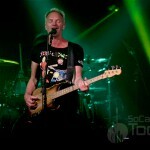 This portion of the set would become the highlight of the evening as the Police classic led into another with “Every Little Thing She Does Is Magic” followed immediately into “Fields Of Gold”, which was performed under yellow LED highlights. The duo took turns in between songs chatting and introducing songs, even taking time to joke about “having fun in Funner (CA)”—the city where Harrah’s calls home that changed its official name in 2012 and boasts David Hasselhoff as the unofficial mayor. 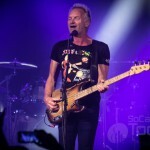 For almost the entire set, Sting played the same visibly worn Fender bass. 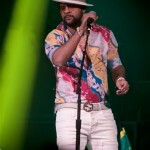 He seemed to hit a vocal wall on “Walking On The Moon”, but Shaggy took over as they mixed in Bob Marley’s “Get Up, Stand Up”. 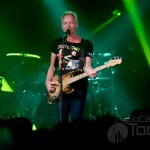 Sting’s son, Joe Sumner stood in and helped back his father up on vocals on “So Lonely”. 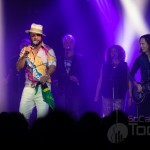 To close out the main set, “Roxanne” was mixed in with Shaggy’s 1995 hit “Boombastic”—the converted ballroom was clearly jumping and gave the duo and their backing musicians a standing ovation. 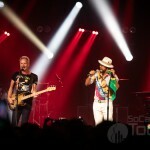 In what would become the first of two encores, the pair returned to play Sting’s Arabic-infused hit “Desert Rose”. 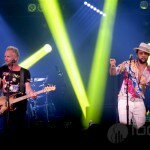 The duo’s apparent playful friendship was on full display during Shaggy’s “It Wasn’t Me”. 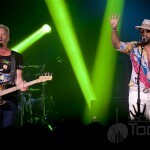 Between Shaggy’s charismatic antics and the clearly uncomfortable lyrics for Sting (singing back-up during the choruses of the song), it was hard not to laugh at the unlikely pairing. 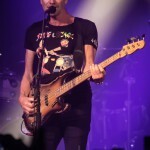 A classic take on “Every Breath You Take” appeared to be the set closer but the crew had two more songs in them for the second encore. 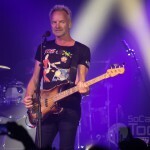 As many in the crowd made their way to the exits they were surprised by a reappearance by the two headliners as they played a nearly acoustic version of Harry Belafonte’s “Jamaica Farewell” before Sting took over and close out the two hour show with his ballad “Fragile”. 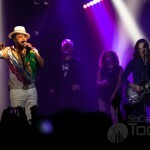 What on the surface appeared to be an unlikely pairing worked out perfectly; holy crap that show was fun! 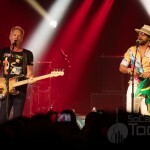 The duo return to SoCal on Monday, October 29th for a rescheduled date at the Santa Barbara Bowl.